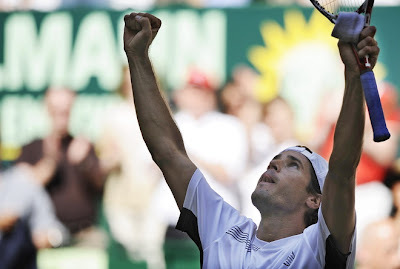 Tommy Haas who once ranked no. 2 back in 2002 (currently no. 41), will be playing his first final since winning the 2007 Morgan Keegan Tennis Championshps in Memphis. After a great run at the French Open, which he eventually lost to champion Roger Federer in the quarterfinals, Haas will have a chance to stop Novak Djokovic who is bidding to win his first grass court title. Haas beat fellow compatriot Philipp Kohlschreiber 2-6, 7-6 (5), 7-6 (3) in an all-German semifinal at the Gerry Weber Open yesterday. In another semifinals, Novak Djokovic defeated qualifier Olivier Rochus 7-6 (7), 6-4 at this Wimbledon tuneup. “I had to work hard for my points, especially on his serve,” Djokovic said. This is Djokovic’s second final on grass, after Queen’s Club last year, which he lost to 2008 Wimbledon champion Rafael Nadal. Numbers wise, Djokovic has the advantage as he has beaten Haas twice in their last two matches. The 31-year-old Haas has been slowed by injuries. He had his third shoulder operation in 2007. Haas said the sunshine after wet, cloudy days created shadows on the court that bothered him at the start.